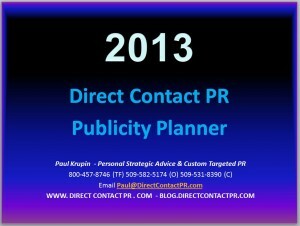 Every year I create a forward-looking publicity calendar to help identify opportunities for media coverage in advance which is available in a free pdf file download. It contains a lot of unusual holidays so that you can get creative, think ahead, and identify ways to tie-in to calendar events well in advance of the day they occur. Many more useful tips, articles and resources are included in the calendar. The calendar can be printed or used on your computer. Share freely. Reach out and help the people you can help the most. Enjoy! Happy New Year! Stay safe wherever you go! When you write a news release your goal is to get publicity – media coverage about you and your book – either an article or an interview. To do that you have to write a news release that is persuasive and interesting and then make sure it gets to media decision makers. The technology you use to reach media decision makers has an incredible influence on the effectiveness of your outreach. Online news release services will post a news release (a page of text and some even do multimedia pages) and then post a snippet (short description) or maybe even just a headline or a subject line with a link to the news release page and your content. Media have to search to find it and read it. The headline may be on top of the list of news releases posted for only a few minutes before another one is added to the system and then it gets pushed down as it is replaced by others. It may be accessible to media if they have signed up to receive news releases for selected keywords they are interested in. But they still may only receive an email with a list of subject lines or snippets and this may not produce a very high response. The data you see on the reports from these services is also terribly misleading. You do not know really how many people saw your pitch, compared to how many machines or even search engine spiders actually are causing the hit. Page hits do not equal media coverage. The challenge with this process is that you have to communicate meaningfully with media and first persuade them to give you coverage and second, the coverage you get has to trigger action on the part of the audience. I prefer using email html and the phone to get maximum effect when I write a news release. This way you hit the maximum number of key media people directly with a pitch and follow up with them so you find out if they even received it, and if so what they think. If you can get them interested in getting more ideas, information and proposals from you, then the door opens. . When can you send out a news release? Answer: as soon as your books are available! 2. the book is available for purchase on Amazon and your web site at a minimum (and maybe other places as well). Timing is roughly based on when you want the publicity to hit taking into account the normal lead time the media needs to do what they do even if they decide to do a feature story, an interview or a book review the day your book arrives in their hands. Your web site and Amazon need to be in place and operational so you derive the financial benefit of your promotion. Now from experience (and I do send out lots of news releases for authors and publishing companies), 95 percent of the media response to a news release transmitted by email occurs within 24 to 48 hours of delivery. Then you have to stuff a package (with a book and a copy of your news release at a minimum), send it by street mail (I recommend First Class or Priority and never media mail), then wait for delivery (five to seven days), then wait for the media to review the book or take action (review time on the book and work time to take action on your proposal for media coverage). The minimum lead time for media is usually two to three publishing cycles. So for online media you can estimate that even once they get the book and if they read it right away, it’s one to two weeks. For daily newspapers it is two to three weeks. Same for radio. TV varies on the urgency and perceived interest but the normal lead time is three to four weeks. For magazines, the lead time if four to six months. I recommend you transmit your news release on timed for Tuesday, Wednesday or Thursday delivery. The media tend to operate on a five day work week. Saturday and Sunday they are gone. Friday tends to be a bad day because they are wrapping things up and trying to get their desk cleared before the weekend. Monday is a bad day because they are catching up from Friday and also have staff meeting and priority assignment from on high. By Tuesday, you can get the maximum attention to read and respond to your proposal and it gives the media the rest of the week to identify, allocate and deploy the resources needed to give you the type of publicity you seek. You may think that sending an eBook will expedite reviews. Don’t make that assumption. Media seek to validate when they get a review copy. They want to make sure they recommend something good that has real value. The ebook or pdf file is too readily deleted, discarded or ignored for you to trust a media to do a quality review. The best way I know to maximize your success with media is to make a quality presentation and give them what they need to do the best job you want done. Send them a quality book, a quality pitch, photographs of the cover and the author, plus feature story quality content and value. I can’t advise you on how to prevent it or stop it, although there may be techie ways to reduce the risks. I believe that there are evil people out there and you cannot avoid all of them if they want to steal from you. I honestly think spending time chasing down the evil people is a time-wasting negative spiral that will fail to produce meaningful success or personal satisfaction given the choices you have to create the positive platform you want to achieve success. What you can do is market and promote and publicize so effectively and thoroughly that the number of people who steal from you is de minimis compared to the income that you derive from your publishing and other related sources of income, and because of the sheer power, presence and reach of the personal and professional brand you have created for yourself. Focus on helping the people you can help the most. Get out there in front of the people you want to reach so many times and give them such quality content, advice, information and entertainment that the links to your articles and posts you get on your own and other people’s sites simply overwhelm the organic search results that contain the links to the illegal download sites. Be so active in media and the online communities you can participate in that when a question pertaining to the subject of your area of expertise comes up, you are top of mind because the wonderful things people are saying about you block the discovery of the sites that cause you harm. You have the choice. You can be passive and stay in the ‘if you build it they will come’ mode (very similar to the ‘pray and do little if anything’ mode), or you can decide to get systematically active with your marketing communications and realize that every day gives you the opportunity to reach out and answer someone’s question and share the answer so that tens if not hundreds of people see that answer and are presented with a new reason to call on you. Even one article or post a month, shared on twenty blogs and media sites per month is 240 new incoming links in a year and then you also get the Tweets, FB shout outs, and other social media links that go with those. So you want to know what to do? Ignore them. Build your platform! Choose to do the things that you need to do to be successful for yourself. Focus on your outreach. What you focus on will get bigger. If you want to be flying with the eagles, stay away from the turkeys. OK, you send out a news release. You asked for a review, a feature story or an interview. You gave them options, incentives, access to data, photos, people. They said NO! Is it all over? Is that all there is? Has the door to opportunity slammed in your face? No rarely means No. It usually means not now. It means maybe later. But it is up to you to figure out what do do. And what you do is simple: You make another proposal. You offer to send another idea. You say, how about i call you back in two hours (after your deadline has passed). Always pitch back another idea for something else. Never let the conversation stop. Take the action and get them to say yes to something that keeps the conversation going. Find out what the media wants. Then give them what they need and make it easy for them to work with you. That’s how you’ll get respect from media for being a valued contributor and a working professional they can trust and rely upon to help them do their job. That’s how you’ll close more deals and get more of what you want, too.